What does Optimum Nutrition Gold Standard Pre Workout do? Unleash your amplified focus, energy and enhanced endurance with Optimum Nutritions new Gold Standard Pre-Workout and reach the pinnacle of your game, crush your next set, get that last rep, and achieve some true gains. No matter what your goals are, accomplish them all with the pre-workout from the world's most trusted brand in sports nutrition. Why use Optimum Nutrition Gold Standard Pre Workout? What is in Gold Standard Pre Workout? This formula raises the bar by providing you with only what you need to achieve your True Strength —made with select banned substance free ingredients, including caffeine from only natural sources (tea and coffee bean) to help dial in intense energy, mental alertness, and sharp focus before you hit the gym. Gold Standard Pre-Workout is also made with only premium ingredients including CarnoSyn Beta-Alanine, which supports your intramuscular buffering system to help you train harder, longer and German-engineered Creapure Creatine Monohydrate — one of the industry's most well-known providers of high purity creatine monohydrate. Finally, the Gold Standard of pre-workouts includes L-Citrulline Malate — a precursor to Nitric Oxide (N.O.) synthesis and other ingredients such as AstraGIN and Acetyl-L-Carnitine HCI to round out this powerful formulation. Experience the Gold Standard of Pre Workout Flavors: Optimum has raised the bar on flavor to a new level. Available in Blueberry Lemonade, Watermelon, Green Apple, and Fruit Punch, Gold Standard Pre-Workout leaves all other pre-workouts behind on performance AND taste. When it comes to your workouts and your performance, take it seriously and don’t settle for a second place product, get the legit pre-workout that’s is THE GOLD STANDARD! 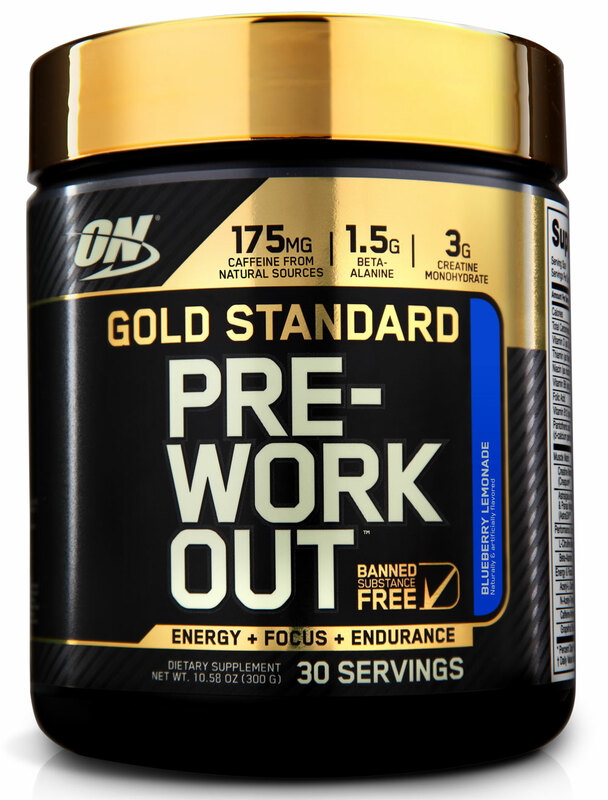 Buy Optimum Gold Standard Pre Workout from Fitness Market and save! With our efficient dispatching and quick delivery throughout Australia, Optimum Gold Standard Pre Workout can be yours sooner. Below you can rate and add reviews for Optimum Gold Standard Pre Workout.